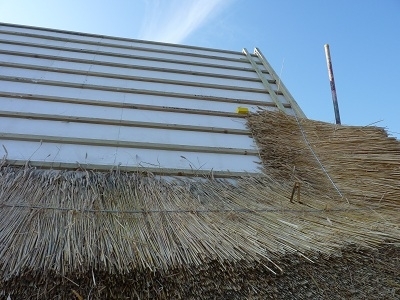 Thatching Advisory Services (TAS) recently provided its Thatch Fireboard System for a new property in Milton Keynes. The thatched property was built by Acorn Construction (Newbury) Ltd as part of the Rivar New Homes Maltings Farm development comprising eleven new properties and three barn conversions. Graham Knowles of Acorn and Rob Norcott from TAS worked closely together on the project, which saw the new Thatchbatt® wired fixing system being built into the design. This was then submitted to the NHBC who gave its approval for the system. Our Thatch Fireboard System is made up of: TAS100 Thatch Fireboard, Thatchbatts®, intumescent joint sealant and the wired fixing system. This combination produces a system that will meet the current insulation and fire requirements for building control and also meets the performance criteria of the Dorset Model. The roof was thatched by Jason Duggan using combed wheat reed.